The best Asian food I’ve ever had in Yellowknife was Filipino. Sure, there are two Chinese restaurants, two Vietnamese restaurants, two sushi joints, three Indian vendors and a Thai food truck. But when I ate the silogs Dorothy and Joselito “June” De Leon made for me at their restaurant in the Territory's Legislative Assembly, I couldn’t help but appreciate how simple and delicious they were. Silogs are Filipino dishes with garlic fried rice and eggs made to order. At Epic Grill, you can have them topped with longanisa, a sweet sausage; tapa, which is thinly sliced, marinated and spiced top round sirloin steak; or tocino, a thinly sliced and seasoned pork shoulder or loin. It didn’t hurt that the couple reminded me of my ex’s kind Filipino parents, who lived a few minutes away from my childhood home. The De Leons aren’t the only people from the warm, Southeast Asian country to immigrate to the capital city of the Northwest Territories in pursuit of work. According to Statistics Canada’s 2011 census, Filipinos are the largest visible-minority group in Yellowknife. Tagalog, a dialect whose standardized form is an official language of the Philippines, is the mother tongue of 520 people, or 2.7 per cent, of the city’s total population. This makes it the most commonly spoken language in Yellowknife after English and French. Its presence isn’t a recent phenomenon. According to the Yellowknife archives, multiple Filipino families came to the city more than 30 years ago in the 1970s, including the Riveras, the Santoses and the Masongsongs. Filipinos are now a significant presence on staff at many offices and businesses around town. A former employee of the now-closed KFC on 48th Street once told me: "Canadian Tire? They should call it Filipino Tire." While the city is known for its outdoor activities, basketball is the predominant recreational interest of many Filipino residents. Carlos Esteban, head of the city's Filipino Basketball League, oversees more than a hundred male and female players who gather together at Sir Franklin John High School for games, socializing, and community-building. 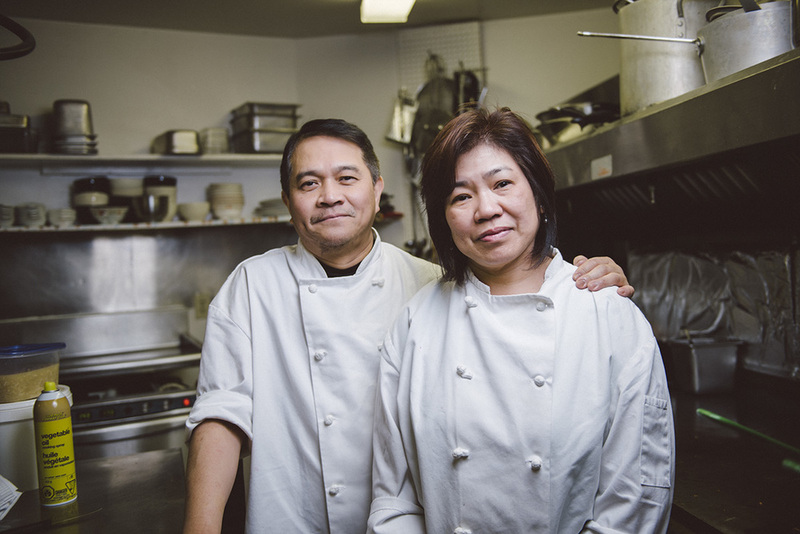 Back at the Epic Grill, I learned how Dorothy and June have used their restaurant to introduce the people (and many of the politicians) of the Northwest Territories to Filipino food. Originally located inside the Arnica Inn, one of Yellowknife’s hotels, Epic Grill moved to their current space inside the Legislative Assembly in April after winning the official catering contract for two years. In addition to serving breakfast and lunch on a daily basis, the De Leons regularly provide catering for the territory's politicians, territorial staff and any visiting officials. The couple take their new responsibility seriously. They noted that the executive chef of the White House, Cristeta Comerford, is also of Filipino descent. During my meal with the De Leons, our conversation covers their careers in Yellowknife, their family, and their hiring plans for when the government’s meeting season really gears up. We end on a sweet note when Dorothy reveals that she also bakes Filipino desserts, such as leche flan and ube (taro) cakes topped with sweetened slices of coconut. She brings out a perfect personal-sized cake for me. Even before my first bite, I know that I can’t wait to eat with them again.